The 12-year-old Rohingya refugee dreamed of Ramzan back in his own village — fish to break the day’s fast, gifts from his family and relaxing beneath the trees before evening prayers at the mosque. But for MD Hashim and others like him living in squalor in Bangladesh, the start of the Islamic holy month now serves as a bitter reminder of everything they have lost since being driven from Myanmar in an army crackdown. “Here, we can’t afford gifts and don’t have good food… because this is not our country,” Hashim told AFP on a barren hillside in Cox’s Bazar district. While they acknowledge that they were lucky to escape, now, with food and money scarce and temperatures soaring, Ramzan looms as a source of anxiety for many Rohingya. Sitting inside a plastic tent on a blazing day, Hashim fondly recalled the simple pleasures that made Ramzan the most exciting time of year in his village. New clothes would be offered and sprinkled with traditional perfumes called “attar” to mark the holiday, he said. “We can’t do the same here, because we don’t have money. We don’t have our own land. We can’t earn money because we are not allowed,” Hashim said. The Rohingya are barred from working and more than two dozen military checkpoints restrict them from leaving what has grown into the world’s largest refugee camp. “We cannot fast here like we did back in Burma (Myanmar), because it’s too hot. There are no trees,” he told AFP. Even so, Hashim is one of the fortunate ones, able to celebrate with his family. Other Rohingya children will spend Ramzan not just away from home, but alone. 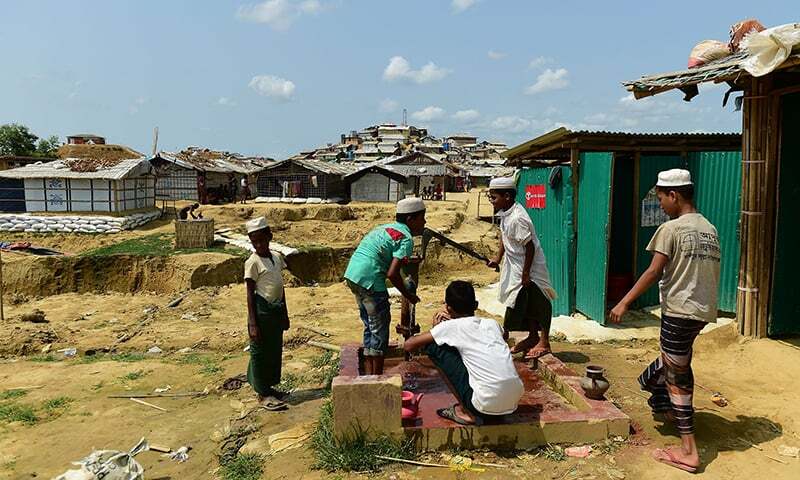 “Unfortunately, it will be their first Ramzan to remember for the wrong reasons,” Roberta Businaro from Save the Children told AFP in Cox’s Bazar. The Quran exempts the ill, elderly and others who cannot fast from giving up food and water. But despite the hardship, the Rohingya would not abandon their traditions, no matter how challenging their circumstances, said imam Muhammad Yusuf. “It will be difficult while the sun is so hot, but we will still fast,” Yusuf told AFP.